This recipe is a tribute to a friend who so generously acted as beauty consultant / hair colorist for me yesterday. To thank her, I made these gluten-free pizzas, which are completely delicious whether g-free is your lifestyle (hers) or not (mine). Though gluten is fine by me, I’ve found that a lot of the things I love to cook (and eat) are already gluten-free. So when I find a recipe, like this one, that is totally dreamy and healthy AND fits in with the g-free life, I love to share it. This is one of those! 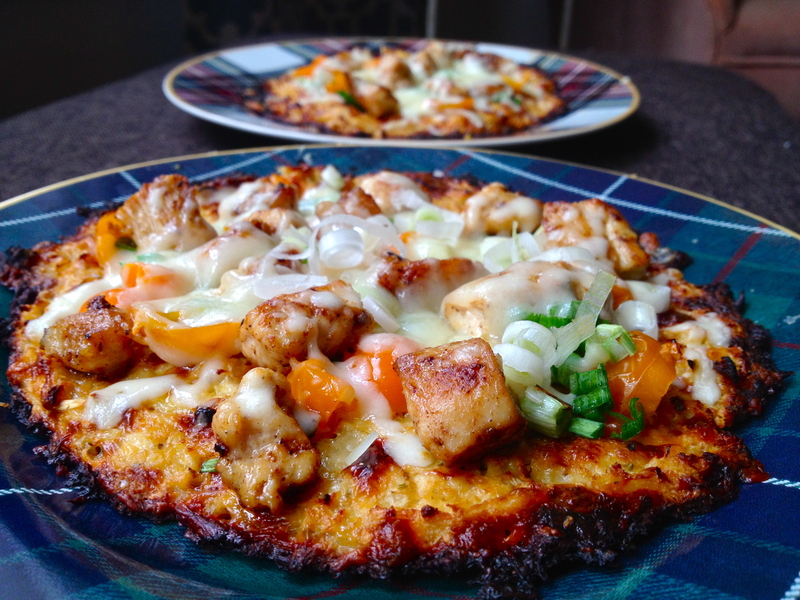 I came upon essentially the same ingenious recipe on 3 of my favorite blogs, and this is my version of that awesomely tasty and healthy pizza. Yum! And thanks Jeni! 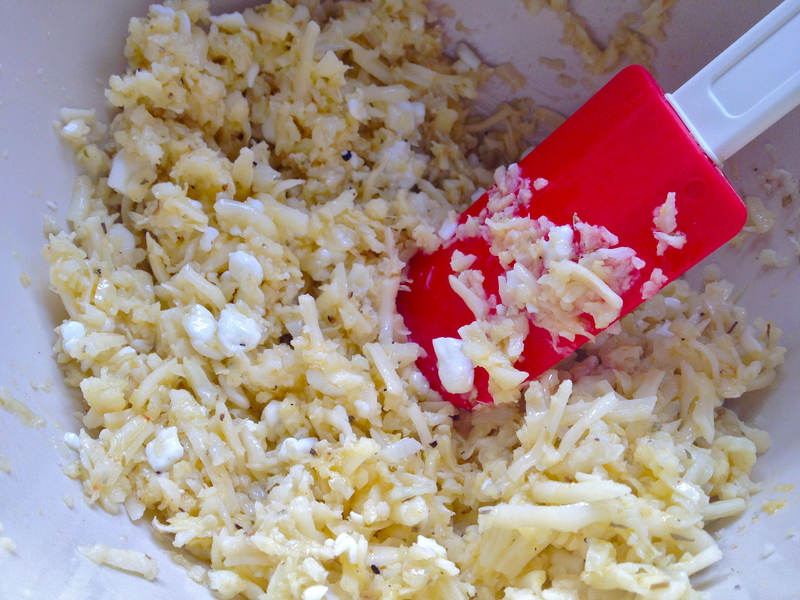 First, put the grated cauliflower into a bowl and microwave for 7 minutes, covered with a washcloth or paper towel. When it’s cooked, mix all the crust ingredients in a bowl. Use more or less cottage cheese, depending on how dry the mixture is and how it’s holding together. 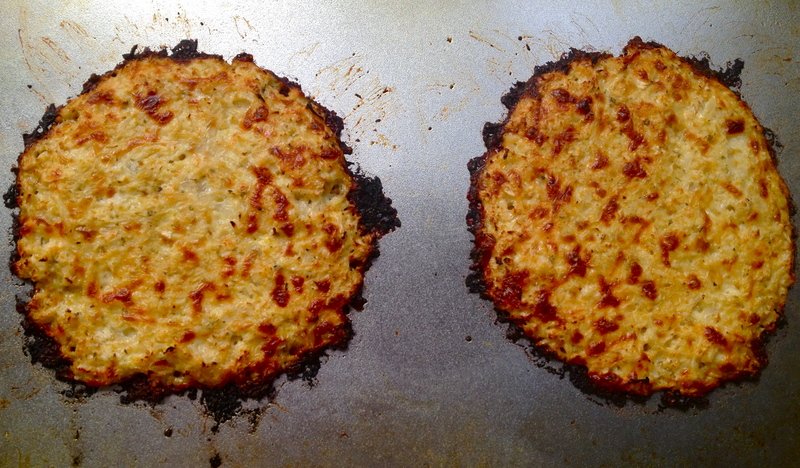 On a greased baking pan, shape the cauliflower mixture into two flat discs, as thick or thin as you like. 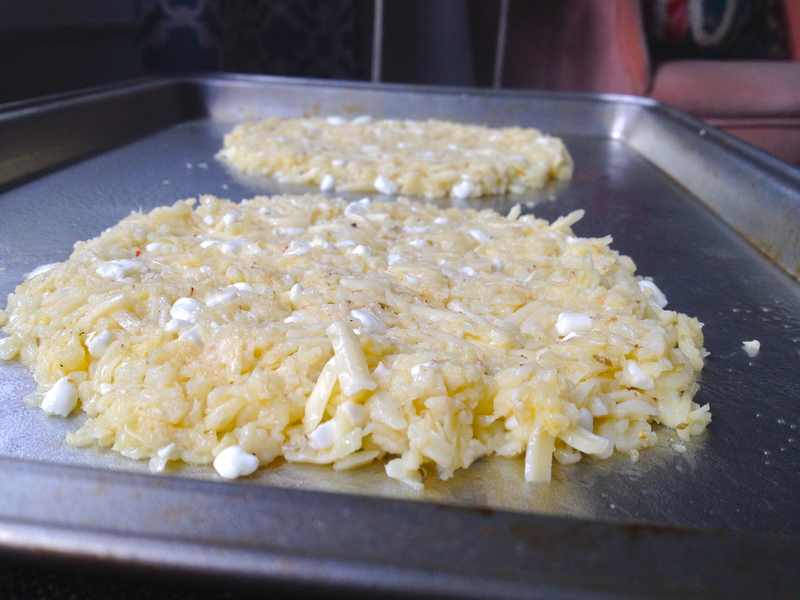 Bake them for about 15 minutes, or until the edges are browned and the top is flecked with bits of golden melted cheese. The thickness of the crusts will affect baking time, so make sure to keep an eye on them. Once the crusts come out of the oven, I use a spatula to loosen them from the bottom of the pan and make sure they come off in one piece, because this will be a lot harder to do once they’re topped with cheese and other wonderful things. Before you start with the toppings, turn up your oven to broil (or to very, very hot!). The pizzas only have a few minutes left to cook, and we want to do it at a high heat. On to the beautiful toppings. 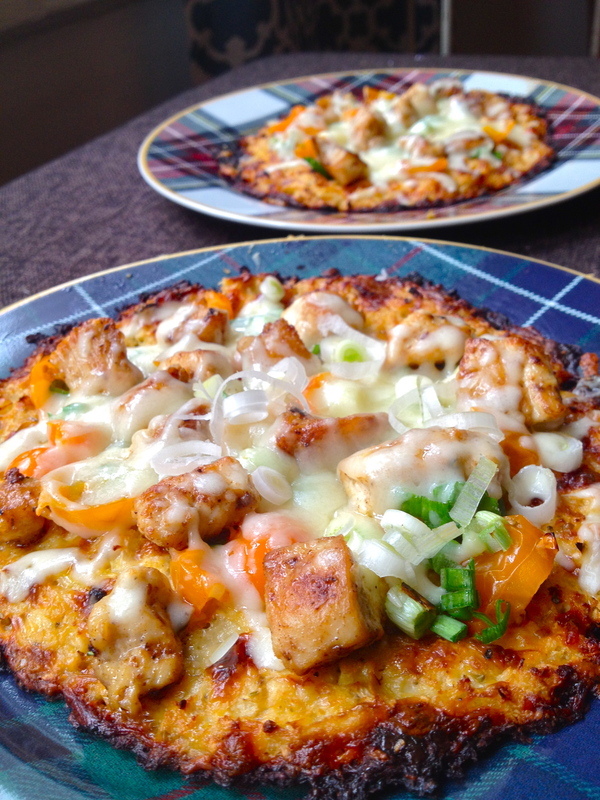 They can truly be whatever you want – we went with chicken, green onion, tomato, and cheese, and they were fantastic! Stick back in the oven for 3-5 minutes, until the cheese is melted and has started to turn a little golden. Sprinkle with some more green onion or some oregano and dig in! Previous Rosemary Lemon Roasted Brussels Sprouts. Next Egg in the Pepper. My dad wants to say great pizza – he wants me to make this for us. Haha. I’m typing this on his email address. hahaha. hi guys!! actually this one is pretty easy and doesn’t take that long! you probably should make it. 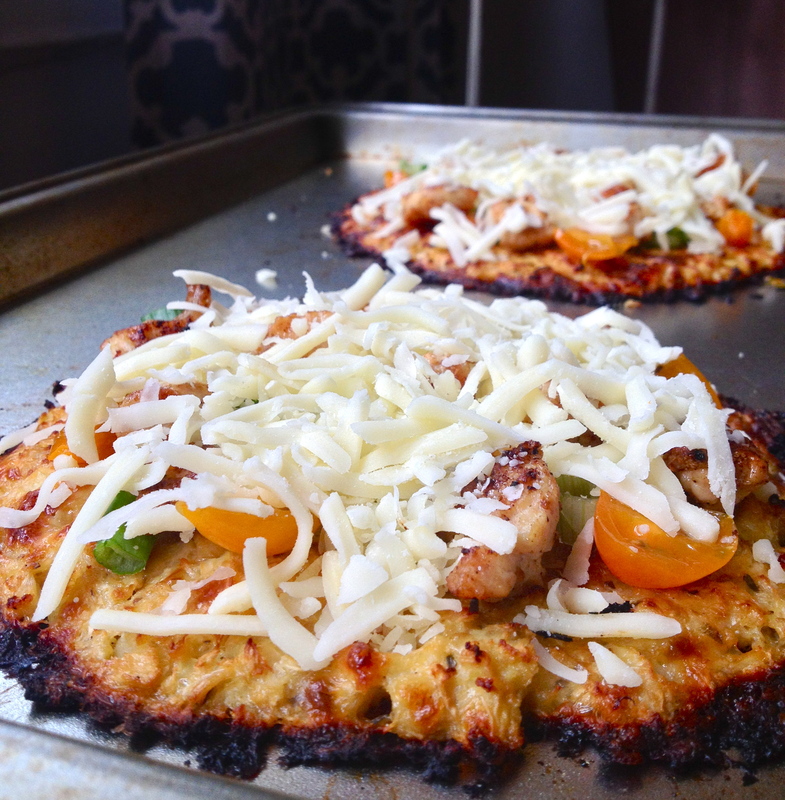 I’ve seen this cauliflower crust thing on a ton of blogs, and now I’m super-curious. How does it taste, exactly? Is it especially cauliflower-y, or more neutral? It’s funny, we would never have known it was cauliflower for sure. The texture is nothing like cauliflower and it doesn’t really have that cauliflowery taste – I think the cheese and the oven-baking kind of drown it out. DEFINITELY worth a try though! I’ve been meaning to make a gluten-free crust but haven’t gotten around to it yet. Glad to hear yours turned out well and that you enjoyed it! I had this one saved forever and when I finally made it, I was so glad I did! I’m not normally a huge fan of cauliflower but this is a really great crust. A cauliflower base is a great idea! I love it! Plus it looks delicious!